A friend of mine asked to take lessons when she read my status on Facebook last week about only paying $17 for $71 for groceries. That made me laugh because I just follow several deal blogs & do what they tell me! 1. I buy two St. Louis Post papers & one local paper every Sunday on the way home from church. (My kids love this because they get to read the comics—family tradition here) This costs me about $5. If I use just 5 coupons I will break even. 2. If I get the time on Sunday, I flip through the coupons & take out & clip any I KNOW that I will use. If not, I will do it while watching a movie one night that week. 3. 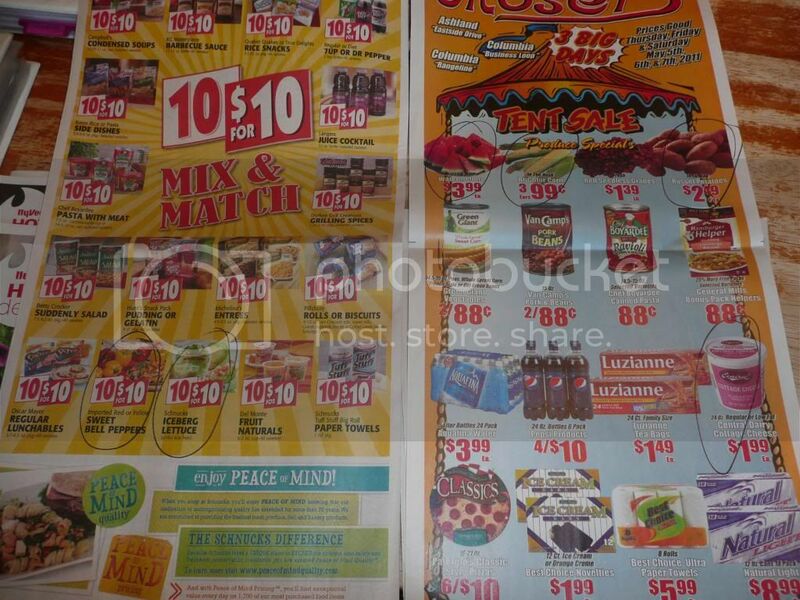 I combine the coupon inserts. That way I have the same coupons together. Notice I am not clipping at this time. 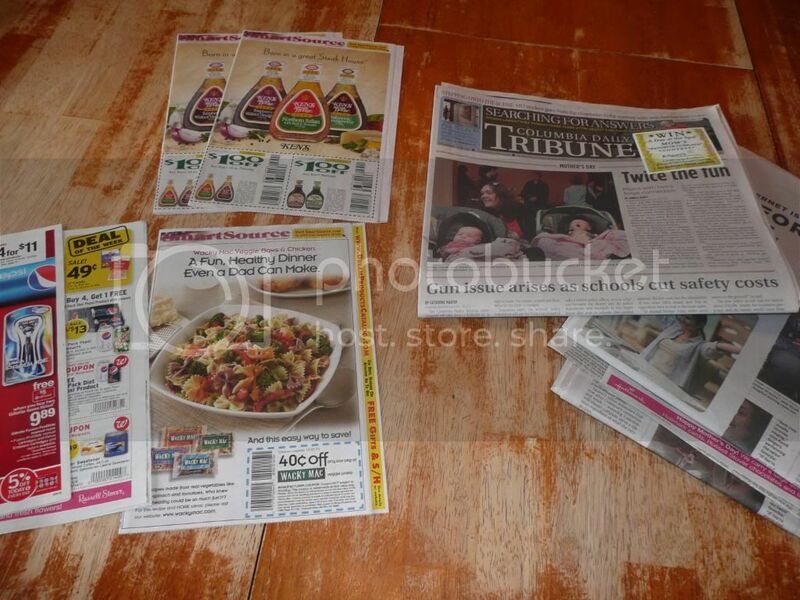 I also throw away all the non coupon(ads) pages from the inserts to reduce the bulk. 4. 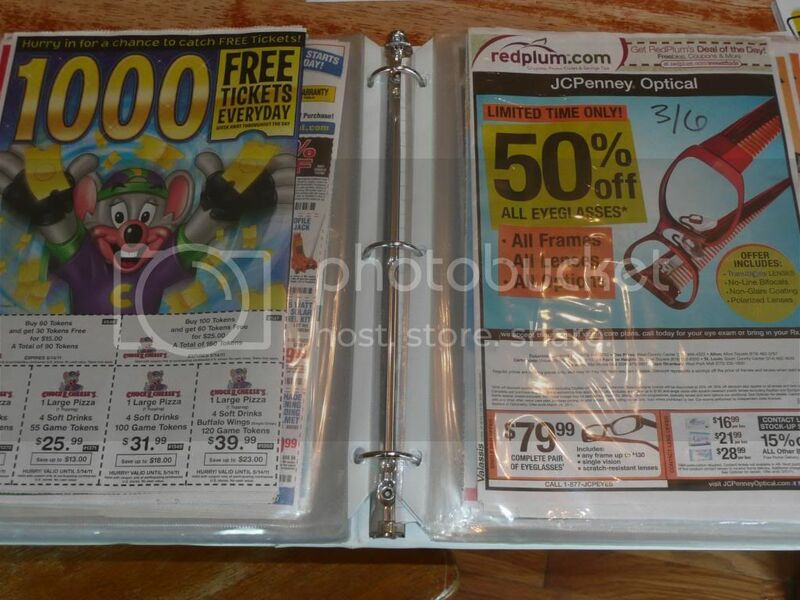 What is left of the inserts gets put in my coupon binder. I mark on the front of the inserts the dates so I can easily find a coupon I need(based on the date). Helps my poor eyes not have to read the fine print later. 5. Locally, there is a free paper that is delivered on Wednesday evening. When that arrives in my drive way I look through the ads for items that I feel are good deals. I frequent several stores—Schnucks, Gerbes, Mosers, Hy-vee, & Aldis. I also go to Target & Wal-mart on less frequent occasions. I also keep a price book to help me with knowing if a price is a good deal. 6. When I find a good deal I circle it in black sharpie so it really jumps off the page at me. 7. 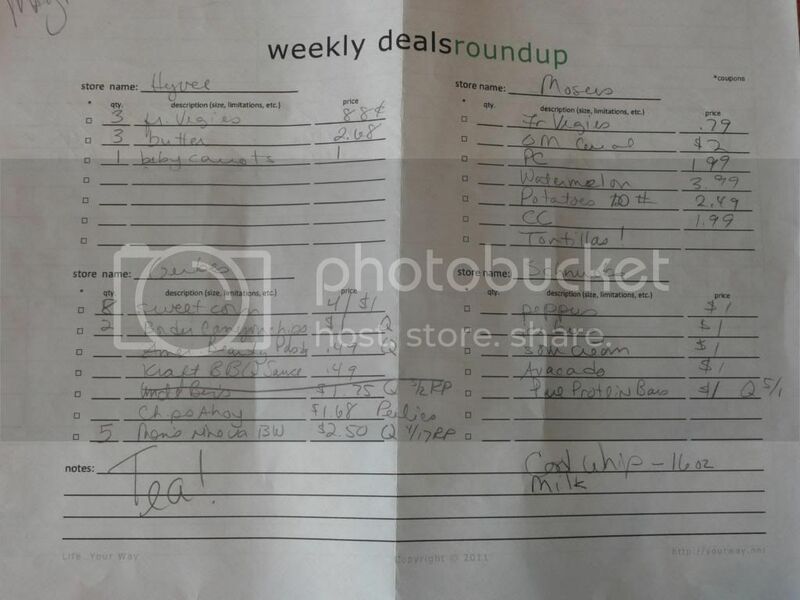 Thursday morning I make a weekly deals round up page from the black circles(idea from Life..Your Way) so I can see easily what I am shopping for when I go. I also mark down any coupons I know about that match up on this page. I check The Savings Jungle to see if she’s found a few more good deals & mark those down on my page. 8. I check my Menu Plan to see what I am going to needfor the the next 7 days and add any ingredients that are needed. Fresh fruit, vegies, bread, & milk get added here too. 9. Lastly I really looks to see what stores have the most deals. I might go to just one or two. Gas prices factor in to this decision. We have piano lessons on Thursday so I hit the stores that are on the way & closest to that. I shop while the kids are at their lesson so I am using my time wisely. We are also out on Tuesdays so I can go to the other stores then if I decide it is really necessary. 10. After my round up page is created I gather the coupons that I need from my binder or my clipped coupon stash(this travels with me). I don’t take my big binder with me to the store. 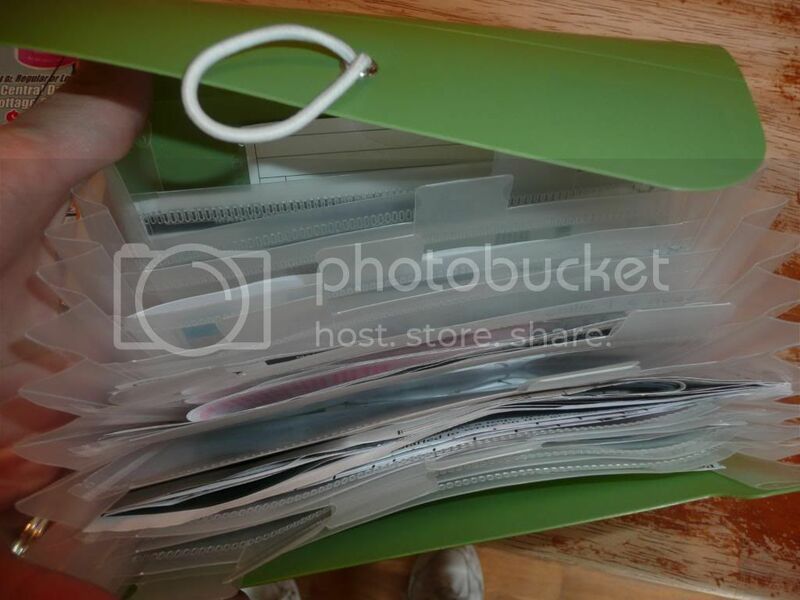 I also print a lot of coupons off the internet and I store those in my traveling stash. 11. Now I am ready to shop. I take along my list & my coupon stash every time I go in to town because you never know when you might have time to swing in a store. All these steps have evolved and are still evolving today. I am sure a year from now I will have found something new or better to use. So take what works for you and leave the rest! But I hope this helps you save money & find a little more wiggle room in your budget!